March marks the start of autumn in South Africa, the perfect time to finally take that local break! With the summer crowds finally settled at home, this is the time to take advantage of more affordable flights. The school holidays start on the 18th of March 2019 and gives families two weeks to enjoy the last remnants of summer. Surprisingly it doesn't look like flight prices have surged around the start of the holiday yet, suggesting most will stay home. Flight prices are however slighly elevated on some routes around Human Rights Day, the 21st of March 2019. In general, travelers will find flights towards the beginning of the week slightly more affordable than flights towards the end of the week. Look for dates highlighted in green below to find the cheapest days to travel. Mango flights from JHB to Cape Town : Avoid travelling towards the end of the week where possible as Thurday to Sunday flights are the most expensive. Mango flights from Cape Town to JHB : Budget conscious travellers should avoid travelling on Sundays where possible as it is the most expensive day of the week to fly on. Mango airfares from Lanseria to Cape Town : Weekend flights are by far the most expensive this month, but travellers will also see a price surge on Human Rights Day. 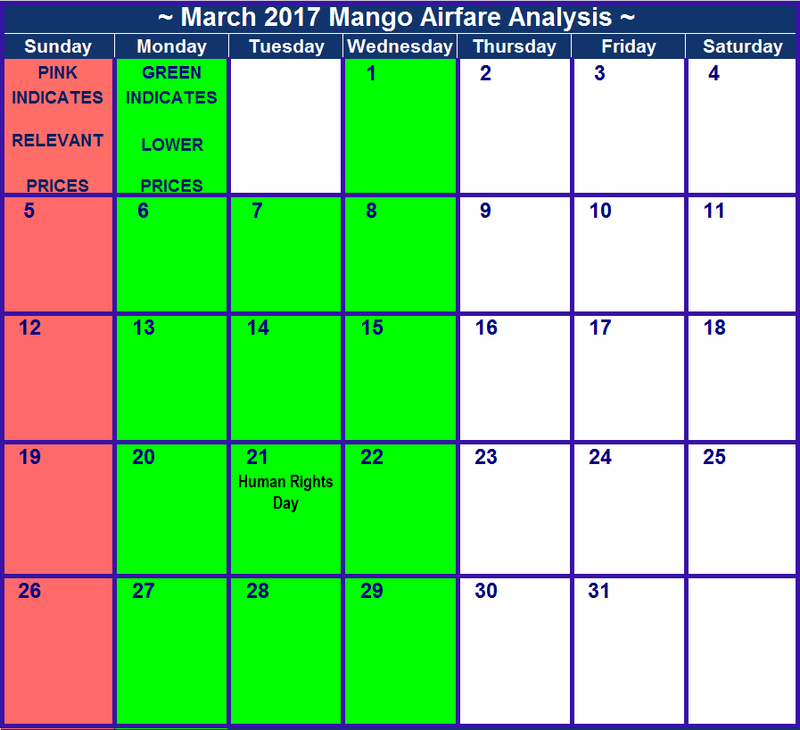 Mango flights from CPT to Lanseria : If you are on a tight budget and flexible with your travel dates, you'll want to avoid the dates highlighted in pink below. Mango flights from JHB to Durban : Cheap flights are readily available throughout the month, as is evidenced by the amount of green spread below. Mango flights from Durban to JHB : Tuesdays to Thursdays are the best weekdays to travel on as the flights are consistently the cheapest. Mango flights from JNB to George : Avoid travelling on the 14th and 15th where possible as those are the most expensive dates to travel on. Mango flights from George to JNB : Saturday and Sunday flights are some of the most expensive this month and should be avoided if possible. Mango flights from CPT to Durban : Tuesdays are a good day for budget-conscious travellers to fly on. Mango flights from Durban to CPT : Frugal travellers should avoid travelling on the 24th and 27th where possible. Mango flights from JHB to Port Elizabeth : Cheap flights are readily available during the first few days of the week. Mango one-way flights Port Elizabeth to JHB : Flights on the 23rd, 24th and 25th of March are the most expensive on this route this month. This survey was completed on the 15th of February 2019. Prices are all subject to change and availability. March starts out fairly quiet, with no key events taking place before the 21st of March 2018. It is only after this date that the peak travel period starts taking effect on flight prices. South Africans celebrate Human Rights Day on the 21st of March. This mid-week public holiday does not really influence flight prices with flights remaining fairly affordable until the 28th of March when the school holidays start. Flight prices increase dramatically during that last week of the month, as the school holidays kicks off and Easter Weekend start. The weekend of the 30th of March is a long one - starting with Good Friday and ending in April. Flight prices increase during this period on most routes and dramatically so on some. Look out for dates highlighted in green if you want to have cash left over for easter eggs! Mango flights from JHB to Cape Town : This is one of the most affordable routes with very consistent prices. Travel on Mondays and Tuesdays to get the cheapest flights. Mango flights from Cape Town to JHB : Look out for the cheapest travel dates highlighted in green below. Avoid travelling on the 25th if possible. Mango airfares from Lanseria to Cape Town : Stretch your budget further by travelling on Mondays and Tuesdays where possible. Mango flights from CPT to Lanseria : Where possible avoid travelling on Mondays and Sundays as those are by far the most expensive days to travel on. Mango flights from JHB to Durban : Cheap flights are readily available during the first half of the month. Mango flights from Durban to JHB : Avoid travelling during the last two weeks of the month where possible. Mango flights from JNB to George : If you're on a budget you should avoid travelling on the 28th, 29th and 30th where possible as those are the most expensive dates to travel. Mango flights from George to JNB : Mid-week flights are the cheapest with the 7th, 8th and 15th of March being the cheapest travel dates. Mango flights from CPT to Durban : The cheapest flights can be found on the 6th, 7th, 19th and the 20th. Mango flights from Durban to CPT : Avoid travelling during the last week of the month as those are the most expensive travel dates. Mango flights from JHB to Port Elizabeth : Friday flights are the most on this route for the month of March. Mango one-way flights Port Elizabeth to JHB : You will find the most affordable flights on Mondays, Tuesdays and Wednesday. Schools aren't out until the end of March and with only one public holiday (Human Rights Day) on the 21st, March is a good month to travel. Flights are generally more affordable on the first three days of the week, with Sundays being the most expensive day to travel on for most routes. As Human Rights Day falls on a Tuesday, flight prices are slightly elevated on the Friday and Tuesday as some make a long weekend out of it. Look out for affordable dates to travel on highlighted in green. Mango flights from JHB to Cape Town : This is one of the most affordable routes with very consistent prices. Avoid flying on Thursdays and Fridays. Mango flights from Cape Town to JHB : The cheapest flight can be found Friday the 10th. Avoid travelling on the 13th. Mango airfares from Lanseria to Cape Town : This is one of the most affordable routes with very consistent prices. Avoid flying on Fridays and Saturdays. Mango flights from CPT to Lanseria : The cheapest flight can be found on the 24th and 31st. Avoid travelling on the 13th. Mango flights from JHB to Durban : This is one of the most affordable routes with very consistent prices. There are price increases on the 3rd, 17th and the 31st. Mango flights from Durban to JHB : The only dates to avoid travelling on are the 3rd, 5th, 12th, 17th, 19th and the 26th. Mango flights from JNB to George : This is one of the most affordable routes with very consistent prices. Avoid travelling on the 16th, 17th, 18th, 30th and the 31st. 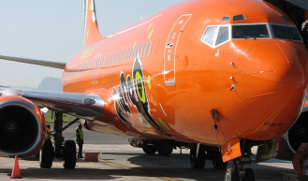 Mango flights from George to JNB : There are affordable prices throughout the month. Avoid flying on the 31st. Mango flights from CPT to Durban : This is one of the most affordable routes with very consistent prices. Avoid travelling on Sundays. Mango flights from Durban to CPT :The cheapest flight can be found on the 14th. Avoid travelling on the 10th. Mango flights from JHB to Port Elizabeth : This is one of the most affordable routes with very consistent prices. Avoid travelling on the 17th and the 31st. Mango one-way flights Port Elizabeth to JHB :This is one of the most affordable routes with very consistent prices. Avoid travelling on the 21st. This year Easter is coming early! Although it is usually reserved for some time in April, this year the chocolate festival is taking place from 25th of March (Good Friday) until the 28th of March 2016 (Family Day). The school holidays also start on the 18th of March 2016, resulting in some very popular travel dates from the 18th until the 26th with quite a few routes already sold out around those dates. Expect flights to be more expensive on most routes from the 18th of March onwards. Some routes are already sold out on the 18th, 19th and 24th of March 2016, so it is advisable to book your flights sooner rather than later. Mango flights from JHB to Cape Town : Avoid travelling on Fridays as they are the most expensive, rather travel on a Monday or Tuesday. Mango flights from Cape Town to JHB : The cheapest flights can be found on Wednesdays and Thursdays. Avoid travelling on the 7th and 27th where possible. 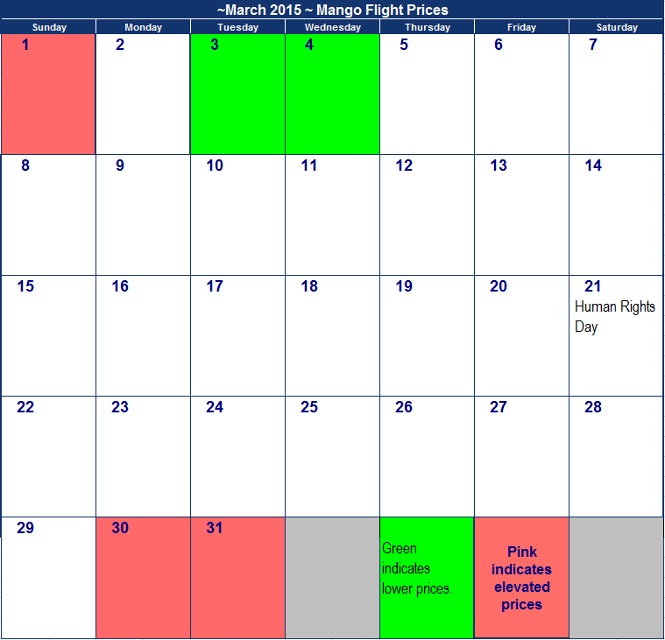 Mango airfares from Lanseria to Cape Town : Avoid travelling on the dates highlighted in pink where possible. Mango flights from CPT to Lanseria : Friday the 4th is the cheapest day to fly from Cape Town to Lanseria. Mango flights from JHB to Durban : This is one of the most affordable routes with very consistent prices. Mango flights from Durban to JHB : The only dates to avoid travelling on are the 27th and 28th, both with slightly elevated flight prices. Mango flights from JNB to George : Dates highlighted in pink indicate the most expensive dates to travel on and should be avoided where possible. Mango flights from George to JNB : Travelling towards the end of the month is quite expensive and should be avoided if possible. Mango flights from CPT to Durban : The 5th is the cheapest date of the month to travel on and the 28th is the date to avoid if possible. Mango flights from Durban to CPT : Avoid travelling on the 24th of March if possible as flight prices are double that of those on the 5th of March 2016. 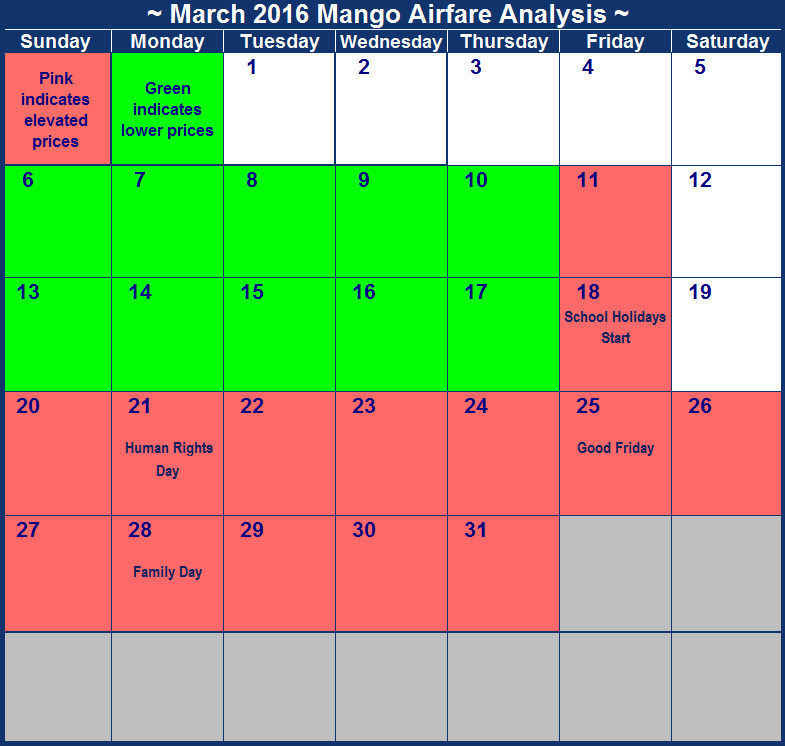 Mango flights from JHB to Port Elizabeth : The only travel date worth avoiding if possible is the 19th of March 2016. Mango one-way flights Port Elizabeth to JHB : Prices are fairly consistent throughout, with the only travel date to avoid being the 28th of March 2016. These flight prices were checked on the 29th of February 2016. Prices and availability might have changed by the time you book these flights. Always check available flights and prices online for an accurate presentation of what is available. There is but one public holiday in March, Human Rights' Day. Unfortunately there are no long weekends or weekdays off as the 21st is a Saturday. If you're one of those lucky people who are still able to turn it into a long weekend, you might want to book now as prices are not yet elevated on those dates. On other dates it varies a lot depending on the route, with the first and last days of the month being the dates you want to avoid. Generally flying in the middle of the month on a weekday is the safest bet. Note that the below list of 1-way flight prices was set up on the 5th of January 2015, and airfares may have changed since (the longer it is since the date the airfares were set up, the greater the chance that prices have changed). Check at Mango what the latest airfares are; and click here to see whether there are any flight specials on the go at the moment. Mango flights from JHB to Cape Town : Prices differ dramaticallyfrom the beginning of the month to those on the 16th and 17th. Mango flights from Cape Town to JHB : Avoid flying back on the Sunday after the public holiday or the last Sunday of the month. Mango airfares from Lanseria to Cape Town : Travelling at the beginning of the month is considerably more affordable than at the end of the month. Mango flights from CPT to Lanseria : Avoid travelling at the end of the month as flights are very expensive. Mango flights from JHB to Durban : This route is the reverse of all the others with the most expensive at the beginning of the month and the cheapest at the end of the month. Mango flights from Durban to JHB : Prices are incredibly consistent throughout the month. Mango flights from JNB to George : Avoid flying on the 27th and 30th of March. Mango flights from George to JNB : Avoid travelling at the beginning and end of the month as prices are elevated around those dates. Mango flights from CPT to Durban : If you can you should avoid travelling on the 1st and 28th of March. Rather travel during the middle of the month. Mango flights from Durban to CPT : Prices are very high on the 5th and 6th of March. Mango flights from JHB to Port Elizabeth : Prices are very inconsisten varying from R494 to R995 - almost doubling! Mango one-way flights Port Elizabeth to JHB : Avoid travelling on the first and last day of the month. Mango flights from Cape Town to PE : Don't travel on the last day of the month as prices are more than double of that which is available in the middle of the month. Mango one-way flights PE to Cape Town : Save a few bucks by flying on the 24th rather than the 31st of March.